There’s not a single person alive who doesn’t love Winnie The Pooh – whether it’s through the popularised Disney version, or through A.A. Milne’s several books featuring the bear with very little brain and his many friends including Piglet, Tigger and the human Christopher Robin, there’s always a soft spot in everybody’s hearts for those innocent characters and timeless adventures. Well, that is except for one person: Christopher Robin himself. This startling and near-revelatory fact is at the centre of Goodbye Christopher Robin, the Simon Curtis-directed biopic of Milne and his young son Christopher Robin Milne, and the directions it takes to showcase what kind of an effect this sort of fame and publicity can have on a small child is part of what makes this stand out from a lot of the other standard biopic fare. It begins as A.A. Milne (Domhnall Gleeson) returns from the First World War unable to fully re-embrace the civilised London society, especially since he’s experiencing some rather serious PTSD. He soon moves his wife Daphne (Margot Robbie) and their young son Christopher Robin (Will Tilston), who is given the nickname “Billy Moon” by his parents, to the Sussex countryside so he can get to writing a piece that strongly condemns war. However, his focus shifts to a more family-friendly audience when he starts playing with little Billy Moon and his active imagination, including playing with his many toys including – of course – a teddy bear, a tiger, a donkey and even a little piglet, among others. He soon creates the world of the Hundred Acre Wood and the character of Winnie-The-Pooh, named after a black bear Billy Moon encounters at the London Zoo, and with it the sole human character of Christopher Robin, and once it’s published it takes off like wildfire and sends both Milne Sr. and Jr. into the spotlight. That is where the film takes a surprisingly strong direction into showing the negative effects of growing up in the spotlight, because poor Billy Moon is suddenly known to everyone by his real name Christopher Robin, and pretty much straight away everybody wants to meet him and lavish all their attention on him. The film allows us to imagine this uncomfortable level of fame from a child’s perspective, and it is rather disconcerting to see how miserable it is making this child who just wants to play with his father and his toys. From large public events to being paraded around clutching the bear that inspired the very book that made him famous, you can feel the toll on this kid’s shoulders and leaves you rather taken aback by how much this child probably really was so exploited in the media, and even worse by his own parents. You see this so often with child actors who became famous at such an early age, with it becoming so extreme for some that they would fall off the rails and right into some bad habits like drugs, alcoholism and whatever else – Macaulay Culkin, Lindsay Lohan and Drew Barrymore are just mere examples of those – and what this movie highlights so well is how exploitative it can easily become for a child to be in the media, to a point where they no longer feel like actual children and more like a constant performing monkey for the world to gawk at. It was this constant exposure that caused Christopher Robin Milne in real life to eventually resent the very fictional creation he had once dreamed up, and in doing so caused a rift between father and son. This is a very bittersweet movie that deals with both sides of the prospect of fame in the literacy world, but at its heart is indeed a tale of a father bonding with his young son and creating a timeless world for his imagination to roam free, one that so happens to also capture the attention of the rest of the world. The connection between actors Domhnall Gleeson and young Will Tilston is on point, and you can see how the stubborn and reserved Milne grows to appreciate his young son’s appetite for playful adventures thanks to Gleeson’s stoic but eccentric delivery, which helps create a character that’s three-dimensional and not just a mere cardboard cut-out. Less fortunate, however, is Margot Robbie who is saddled with playing Milne’s wife as a self-serving debutante whose lust for high society and grander recognition – to a point where she temporarily leaves her husband until he starts writing again – overshadows her moral compass for what is best for her young son. While Robbie does everything she can to give her character the gravitas and larger-than-life personality the real counterpart probably had, it’s still a rather thinly written part that makes her seem shrill and nothing more. There is plenty to admire about Goodbye Christopher Robin, from its daring examination of an early example of child star exploitation to the genuinely moving scenes of father and son bonding, and though it takes its sweet time to really get moving, it’s a movie that’s as sweet as Winnie The Pooh’s favourite snack. 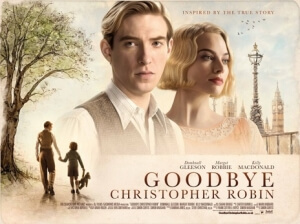 Goodbye Christopher Robin is a fascinating exploration of an early case of child star exploitation, but at its heart is a simple and sweet tale of a father and son bond that is sure to tug at least some of your heartstrings.